ABILENE, Texas (KRBC) - Sunday January 20th at 9:33 PM the earth's shadow will go over the moon continuing to cover more and more. That shadow creating a total lunar eclipse and about an hour in the color will show. "As the light decreases at that point, the light from the sun goes through our atmosphere and its bent. 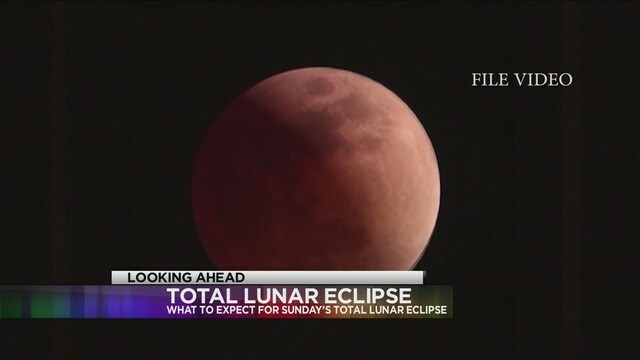 As it refracts some of that light lands on the moon and it can look anywhere from a copper color to almost blood red," said Alan Caffey, Planetarium Teacher Abilene ISD. That color is where people come up with the name "blood moon." "It all depends on what's in the air. If we have more dust or if we have more valcanoes erupting it tends to be more red," said Caffey. The color lasting for about an hour and people are already preparing for it.